I'll admit it. This Helpful Hint is so simple that I am asking myself if it really is "Blogworthy". But! If I save one innocent piece of electronics from the terror of drowning, it shall be worth it! It comes from a bit of Kitchen OCD really. If you cook at all, you're bound to have a timer in the house. If you clean at all, it may get wet. If you are sloppy like me, you'll drown your timer in water. I've done it to the black timer a number of times. It has forgiven me and comes back. After all the thing was made in the early 1980s or before. But it got to be a joke in the house for a while. The timer was in a puddle of water next to the coffee maker in the kitchen, yet again. Empty the batteries out, shake the water out as best you can, air dry it. It may come back. It may not come back. My bad. 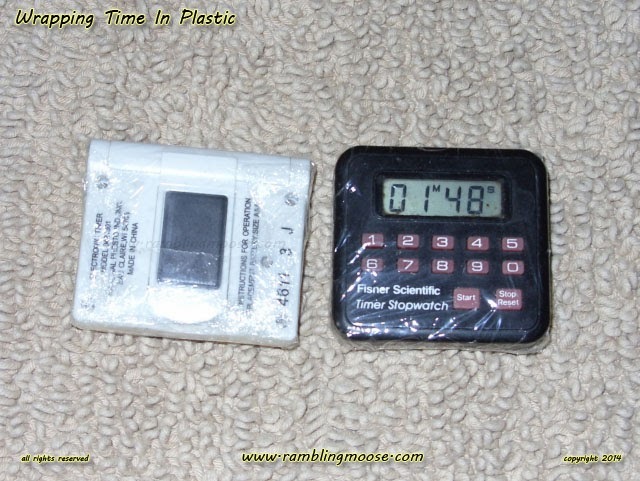 So I got very tired of drowning timers and having to say "Hey, we need a new timer" at the kitchen gadget store because it would start A Discussion. Blah blah blah, SIT! blah blah blah. So I put them in a sandwich bag with a helpful zipper. Didn't work. They're too big and would strangely inflate over time. If anyone could tell me, please, why a low voltage "appliance" was inflating a plastic bag, I'd love to hear a plausible explanation. This morning I was roasting coffee beans. Guatemalan Swiss Water Process Decaf to be specific. Makes a nice Espresso when you don't want a jolt. When I reached for the timer to press the start button I complained that I couldn't feel anything through the plastic bag. Yeah, it's a guy thing. Deal. Got the timer going and found the cling film. Plastic wrap. No name stuff I bought in 1999 in a chef's warehouse kind of place. I still have about a year left of the wrap. One giant roll for 15 plus years of use in many sandwiches, soup bowls, yogurt pot lids, and of course now, kitchen timers. Pull out "enough" cling film to wrap the item securely. Wrap it like a present. Trim the excess plastic. Hold it all in place with a bit of clear tape just like I did on the back. "Viola" that will play beautiful music on your counter. Or at least count beautifully for you. The coffee roasted perfectly, the timer works fine, and it's dry too. Added benefit, there's more "feeling" of the buttons. These are ultra thin in comparison to the plastic bags. Yes, she'll love it. Much more sensitivity. Somehow I seem to have drifted off. Just remember "Wrap your timer!" or "No Glove, No Lovely Cookies! ".